While studying to become a certified Core Energetics Therapist, I was introduced to an insightful model that explained the three layers that make up our personalities. The concept delved beyond what we might think of as the good and bad parts of ourselves. This model provided a way to look beneath the surface and explore our motives and the factors that influence our behaviors – especially the negative ones. Learning about this model was pure EUREKA! Once I understood the components of Self and how they interacted, it became easier to teach people how to uncover their purpose and pursue it without guilt. The model suggests that there are three layers to our personalities. They are the Mask Self, the Lower Self and the Higher Self. If you picture a sphere, the mask is the outer layer, the Lower Self is the middle layer, and as odd as it might seem, the Higher Self is buried underneath the other two at the center – the core. 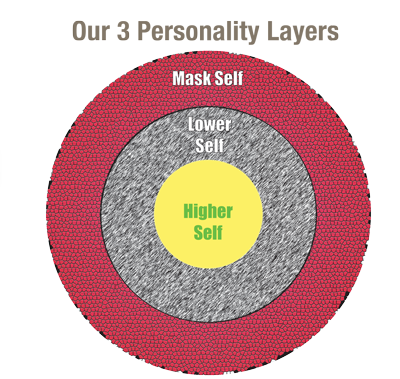 The Mask Self is the top, outer personality layer that has conformed to conditioning. Your Mask is constructed by the beliefs and behaviors you’ve adopted to fit in, to be socially appropriate, and to avoid punishment. Your Mask is your public persona, the aspect most familiar to you and others. It’s the dimension of your being that you identify with most closely and readily. It’s about survival, which is so deeply ingrained, that you believe The Mask to be your true self. You’ll fight for it, defend it, even fake it to avoid embarrassment and discomfort. But your Mask isn’t the real you. The Lower Self – which is the middle layer – is forged by the threats we’ve perceived since we were in our mothers’ wombs. Loud noises, painful life experiences, torturous relationships all damage our emotions and can lead to self-sabotaging decisions or acting out in self-destructive ways. The actual incidents have long been forgotten, but they still influence how we react to the world. These are the roots of fear, skepticism, and behaviors we view as dishonorable or shameful. The Lower Self contains shameful and painful experiences, thoughts and feelings – the kind we avoid acknowledging. Often, they are the faults and flaws we see in others, but we deny that we’re affected by similar demons. Finally, the Higher Self is who we are at our core. This is the real you. It is limitless, pure and loving when it’s not being smothered by the Mask and Lower Selves. The Higher Self is kind, respectful, compassionate, peaceful, joyful and wise. Our unique talents, gifts, passion, purpose and potential reside here – in our Core. When we are at our best, we are expressing our Higher Self. How do you know if you’re tapping into your Higher Self? When what you’re doing boosts your energy level. When what you’re doing is positive and constructive – it serves you and others. When you get lost in it, never minding the time or feeling dragged down by the weight of it. Whether it’s writing code or writing poetry, surfing the waves or the Internet, building relationships or spreadsheets — if you can do it for hours, you’ve tapped into the spring that is your Higher Self. Your core is the place where your unique purpose and passion are waiting for you. Living from your core requires self-love – which is the hardest love to give. Most of us are fairly competent at self-protection, self-defense, self-sabotage, self-criticism and self-denial. Fewer of us know how to love Self. We prefer the masks we’re comfortable with – masks that project the right image and deny the existence of the toxic lower self. Unconsciously and unfortunately, our mask also denies our truest identity, the powerful person we are at our Core. There are so many ways we disconnect from our Core. When we do, we lose contact with our unique gifts – the special talents and abilities with which we were born and were meant to share with the world around us. But, when we proudly use these skills, we embark on a path that leads to greater effectiveness and contentment. ← PODCAST: Caught In A Job Happiness Trap?